Design theory involves examining and evaluating design as a concept. A number of scholars in information systems research have examined and evaluated the concept of design. The focus of design in information systems is on design of IT artifacts. There are differing opinions about what constitutes design for information technology artifacts. Walls et al. (1992) specify two major components of IT design theories: a product component and a development process component. Each draws upon kernel theories (usually taken from the natural or social sciences) in specifying prescriptive hypotheses that enable designers to evaluate whether the product and its development process satisfy the design theory. Goldkuhl (2004) specifies a need for multiple grounding of design theories in external theories, reference theories, value theories, etc. Markus et al. (2002) take a more practical view of design theories, using these theories to explain the means– ends relationship as a practical, prescriptively causal mechanism to justify design components. Source: Hevner, A., March, S. T., Park, J., & Ram, S. (2004). Design science in information systems research. MIS quarterly, 28(1), 75-105. Weber, R. (1987). Toward a theory of artifacts: a paradigmatic base for information systems research. Journal of Information Systems, 1(2), 3-19. Walls, J. G., Widmeyer, G. R., & El Sawy, O. A. (1992). Building an information system design theory for vigilant EIS. Information systems research, 3(1), 36-59. Simon, H. A. (1996). The sciences of the artificial (Vol. 136). MIT press. Markus, M. L., Majchrzak, A., & Gasser, L. (2002). A design theory for systems that support emergent knowledge processes. Mis Quarterly, 179-212. Hevner, A., March, S. T., Park, J., & Ram, S. (2004). Design science in information systems research. MIS quarterly, 28(1), 75-105. Gregor, S., & Jones, D. (2007). The anatomy of a design theory. Journal of the Association for Information Systems, 8(5), 312-335. Peffers, K., Tuunanen, T., Rothenberger, M. A., & Chatterjee, S. (2007). 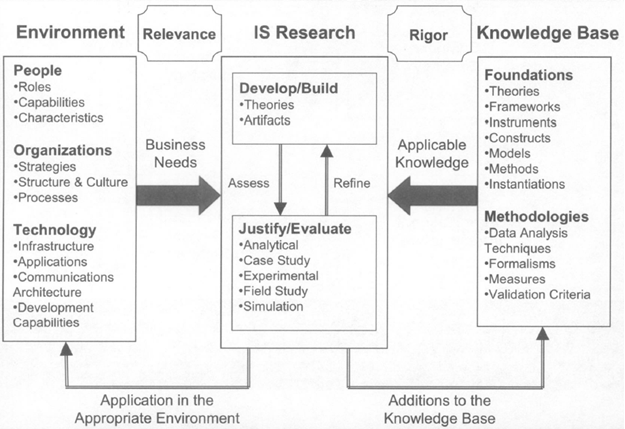 A design science research methodology for information systems research. Journal of management information systems, 24(3), 45-77.